Are you the same way? Well, today I thought I’d give you a super quick craft that combines these two elements. 4 You With Love printables are for PERSONAL USE ONLY! Please do not remove the credits & copyright. Print out your “conversation” sheet and punch the “conversations” out using a 1″ scrapbooking circle punch. If you used a sticker sheet, adhere the “conversations” to your kisses. If you used paper, like me, use scotch tape to adhere your punched out circles. And there you have it, conversation kisses. So quick, easy, and delicious! Isn’t this a fun Valentine’s Day project? 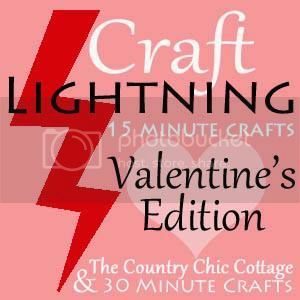 Stop by The Country Chic Cottage or 30 Minute Crafts to see all the latest projects AND link up your own inspirations (however, keep in mind every project must be completed in 15 minutes or less — excluding drying time).